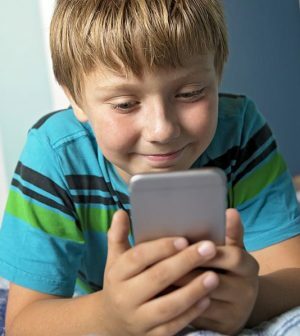 Kids with summer birthdays, especially those who spend long hours playing on smartphones and tablets, might be at greater risk for vision problems, a new study suggests. Nearsightedness, also called myopia, is on the rise worldwide. It’s what eye doctors call a refractive error, meaning the eyes can’t focus light properly. The result: Close objects look clear; distant ones, fuzzy. It’s most often caused by continuously focusing on close objects while the eyes are still developing — as in reading, for example. But the growing use of electronic devices seems to be making the problem worse, researchers report. “As ever, everything should be done in moderation,” said lead researcher Dr. Christopher Hammond, chairman of ophthalmology at King’s College London in England. He urged parents to limit kids’ use of electronic devices. That appears to be especially important for kids born in the summer, the study suggests. That’s because they start formal schooling at a younger age than kids born in winter so they are exposed to more reading sooner. And that increases myopia risk, the researchers said. The researchers added that, while their study doesn’t prove smartphones, tablets and computer games cause nearsightedness, those devices may lead kids to spend less time outdoors. And less time outdoors also appears to increase myopia risk. “We know that time outdoors is protective, and so kids should spend probably up to two hours a day outside,” Hammond said. Myopia can be corrected with glasses, laser surgery or contact lenses. Later in life, however, sufferers are more likely to develop sight-robbing conditions such as cataracts or glaucoma, the researchers said. Experts predict that by 2050, nearly 5 billion people worldwide will have myopia. That compares to about 2 billion in 2010. Genes have been linked to a person’s risk for the condition, but even if it has a genetic component, that doesn’t account for the dramatic increase, Hammond said. For the study, his team collected data on nearly 2,000 twins born in the United Kingdom between 1994 and 1996. The researchers reviewed results of eye tests, as well as social, economic, educational and behavioral data on the twins between the ages of 2 and 16. They also had questionnaires completed by parents and teachers. On average, children started wearing glasses for myopia at age 11. About 5 percent had amblyopia (“lazy eye”), and about 4.5 percent had a squint. Overall, 26 percent of the twins were nearsighted, the study found. Kids who had college-educated mothers, those who were born in summer months and those who spent more time using electronic devices had a higher likelihood of nearsightedness, the study found. The findings were published online Nov. 6 in the British Journal of Ophthalmology. Dr. Tien Wong, medical director of the Singapore National Eye Center, is co-author of an editorial that accompanied the study. “Evidence supports a link between device screen time and myopia, which includes time on phones and tablets,” he said. This is concerning in view of how many young kids have access to these devices, Wong said. Evidence shows 2-year-olds spend up to two hours a day using digital devices. Surprisingly, the researchers said children born as a result of fertility treatment had a 25 percent to 30 percent lower risk for myopia. They said that may be because many are born premature and have developmental delays, which could account for shorter eye length and less myopia. To learn more about myopia, visit the U.S. National Eye Institute.